You can exchange easily the H-alpha system in the LS152THa against this Ca-K Module. So the sun can be observed in H-alpha or in the light of the Calcium-K wavelength - with the same telescope! This module was designed especially for the LS152THa H-alpha telescope. It comes with a completely new focuser. Simply unscrew the three thumbscrews at the LS152THa that hold the H-alpha unit and the focuser. 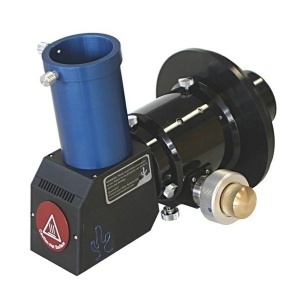 Install here the new focuser with the Ca-K module, and you have changed your LS152T to a real Ca-K telescope. But there is more: with the new focuser (without inserted Ca-K module) the LS152T can also be used as a normal astronomical night-sky telescope! Or you can observe the sun with a additional Lunt 2" Herschel wedge also in white-light! 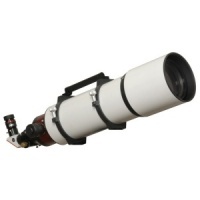 With this accessory the LS152T will become a real multi-purpose telescope! Can only be used with a LS152THa Solar Telescope. Note: LS152THa telescope is not included!